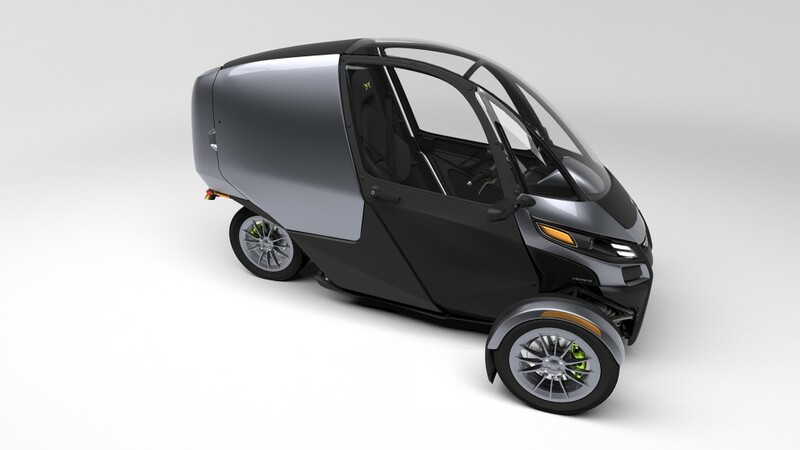 The US Department of Transportation is proposing to “Amend the Definition of 3-Wheeled Vehicles”. 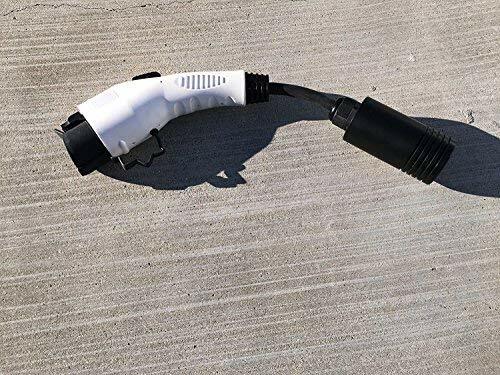 While the description of the Proposed Rulemaking is something I agree with, if the proposed rules had been in place 10 years ago certain aspects of the Electric Vehicle industry would have been held back. There are strong safety reasons to tighten the regulations around 3 wheeled vehicles which purport to be motorcycles, but are for all intents a car. 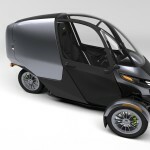 Over the last 10 or so years several companies developed, and sometimes sold, three wheeled electric vehicles which registered as a motorcycle but otherwise behaved as cars. Vehicles with three wheels (or fewer) are considered as motorcycles. Motorcycles have a much smaller list of safety requirements than do cars, and in some cases companies developing three-wheelers with enclosed cabins, doors, windows, steering wheels, car-like seats, etc did so to skirt their way around safety regulations. Abstract:This rulemaking would change the regulatory definition of motorcycle to exclude three-wheeled vehicles that are configured like passenger cars. Under the existing regulatory definition of motorcycle in part 571.3, three-wheeled motor vehicles are classified as motorcycles. This is appropriate for motorcycles with sidecars, trikes, and other three-wheeled vehicles that are based on a motorcycle-like configuration. 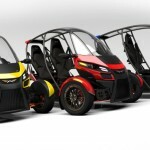 However, other three-wheeled vehicles have passenger-car characteristics such as fully enclosed cabins, hinged doors with roll-up windows, steering wheels, and side-by-side seating. 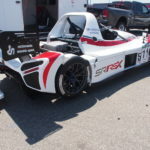 Because these car-like vehicles ride on three wheels instead of four, they are not required to meet federal safety standards for passenger cars (although they are subject to motorcycle safety standards.) 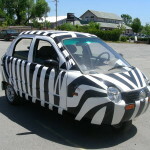 Various car-like three-wheeled vehicle models have been imported into the U.S. and have been available for sale to the public. NHTSA believes consumers who purchase these vehicles are likely to assume that these vehicles have the same safety features and crash protection as passenger cars certified to Federal safety standards. There are some really good points being made in this. What I want to do is discuss the impact on current and past electric vehicle developments, however. NHTSA is working on the proposal (Notice of Proposed Rulemaking) and when it’s ready, we’ll release it publicly for public feedback and work towards a final rule. 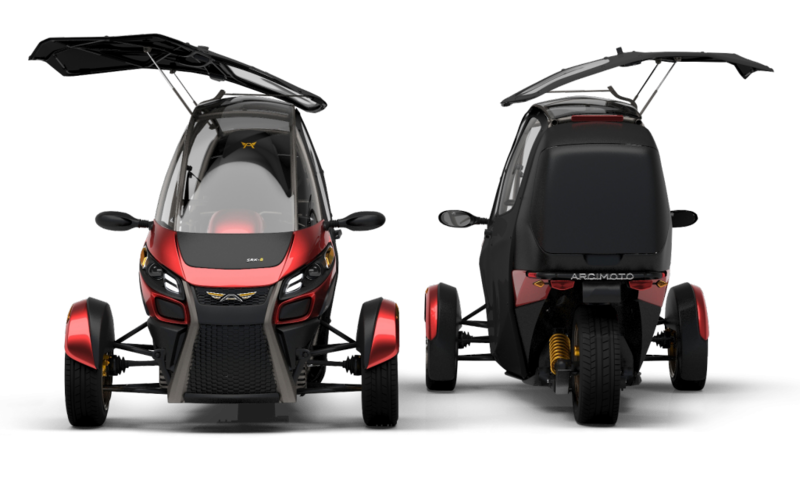 While there’s been several electric 3-wheeler’s fitting the NHTSA’s abstract above, only one (to my knowledge) of those are still an active project. 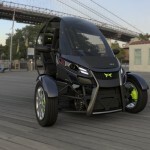 I’m speaking of the Arcimoto SRK, shown here. 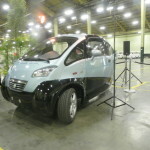 I first heard of the company in 2009 (IIRC) and what’s shown here is their “Generation 8” vehicle. They’re hoping to launch sales of the production vehicle in late 2016. The price target is $12,000 or so, before incentives. 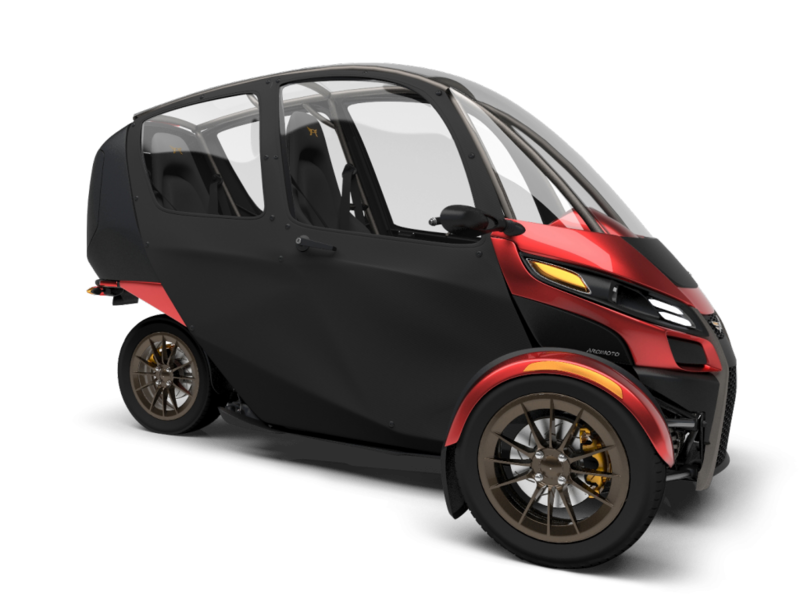 As a motorcycle, the SRK doesn’t qualify for the $7500 tax credit for electric cars, but a much smaller one for electric motorcycles. It’s expected to have a 70 mile range, 85 miles/hr top speed, charge at regular charging stations, etc. 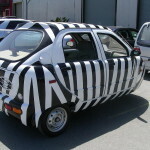 The question is whether vehicles like this one should be considered a motorcycle or a car. 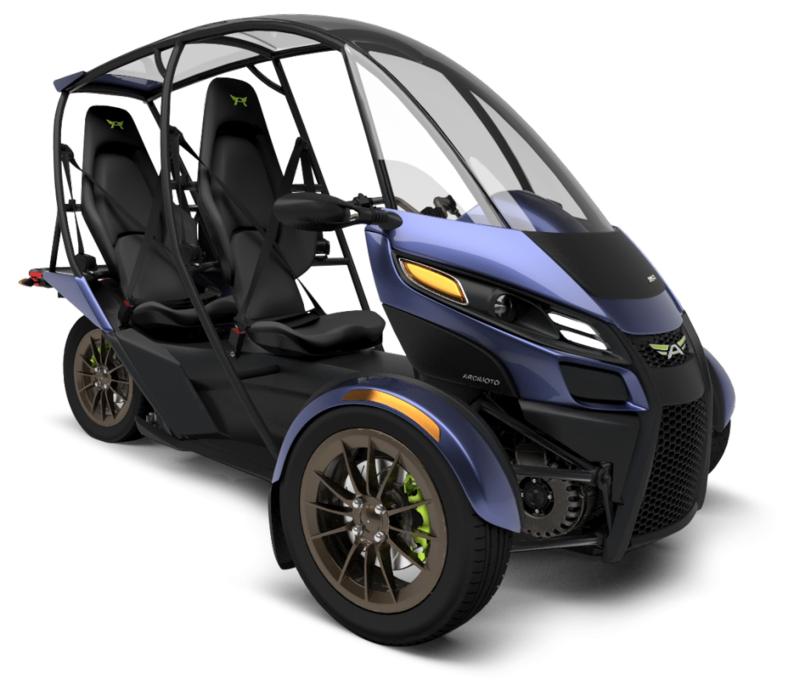 With its open sides, tandem seating, and motorcycle/scooter-like steering the Arcimoto SRK lacks some of the qualifiers used by the NHTSA above. On the other hand, no motorcycle has seats like the SRK’s. And very few motorcycles have a roll cage. And, there are optional doors and optional cargo bays. It looks to me like a very cool vehicle, and I very much want one. This sort of vehicle would be great for urban areas because it’s small size would fit into tight places almost as well as a motorcycle. 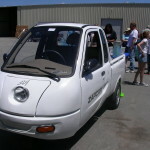 The Aptera was the more famous example of a three wheeled car-like vehicle. At one time this vehicle was receiving oodles of attention, GoogleX had invested in the company, there were tons of passionate believers who’d put down deposit money and so forth. 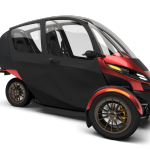 Aptera claimed their choice to build a three wheeler was not to skirt safety regulations, but for overall vehicle efficiency. Having just three wheels apparently meant less rolling resistance, and therefore greater efficiency. Efficiency was a key selling point for the Aptera. 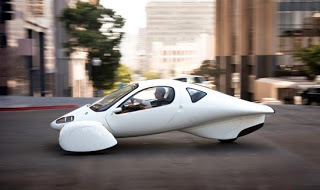 It’s shape gave it extremely good aerodynamics, and the use of composite materials meant even though it was very light the Aptera chassis was very strong. 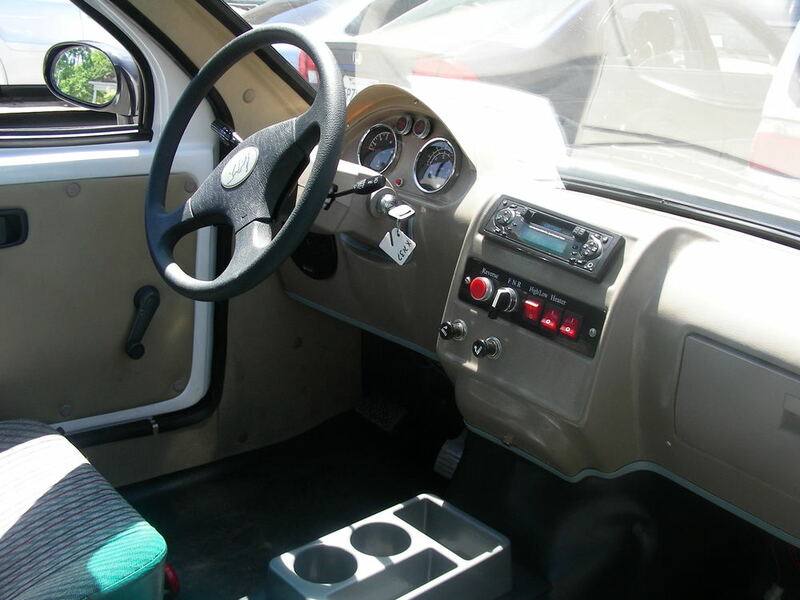 The Aptera had all the features named by the NHTSA abstract above. The Corbin Motors Sparrow was in production and a few hundred were sold to customers before a weirdo financial finagling stopped production. 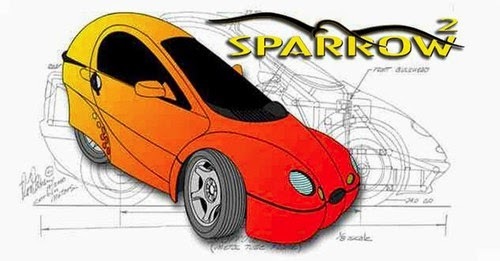 This picture shows the “Sparrow 2” concept vehicle, but it’s not too dissimilar from the model which had been on sale. 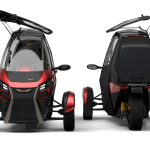 It has a composite shell, electric motor in the rear, batteries at the bottom of the vehicle, a single door which opens like a conventional car door, and a conventional steering wheel. 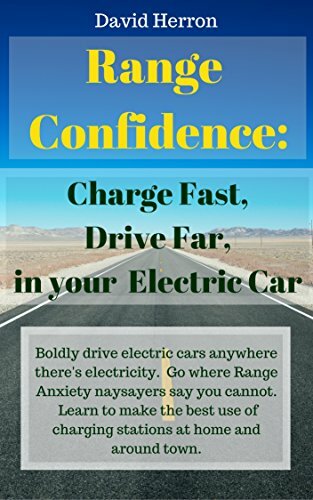 The range and speed was limited because at that time the only energy storage choice was lead-acid batteries. 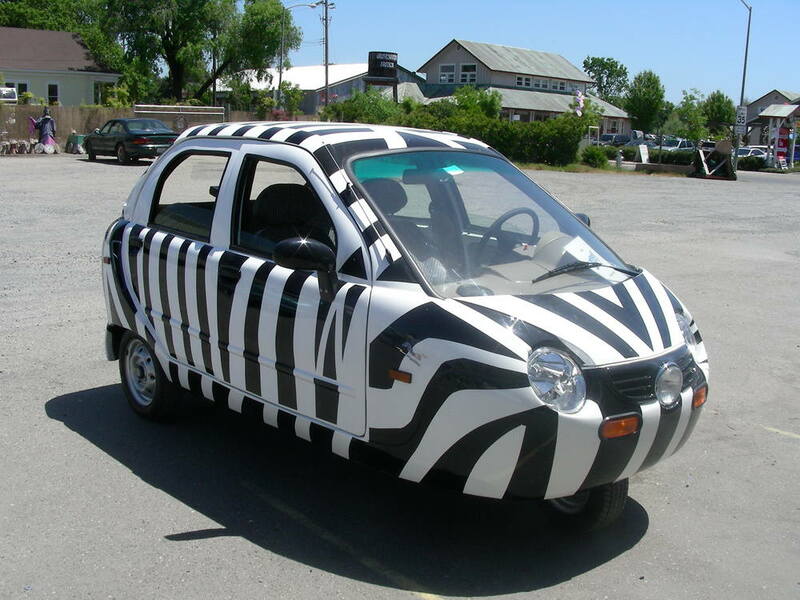 The Zapworld Xebra went on sale in 2006. 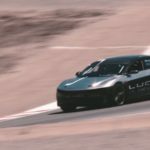 It was built out of a cheap vehicle imported from China, had a top speed around 35-40 miles/hr and a range of around 20 miles. That’s because it was saddled with heavy lead-acid batteries, which was more-or-less all which was available in 2006. The Sedan version sat four people, and the Pickup version sat two. It had one wheel in front and two in the rear. A few hundred were sold between 2006 and 2008. The 2008 model faced a serious problem due to the braking system, and there’s been an effort underway for several years to institute a recall to fix the brakes. Unfortunately the company pretty much went out of business, and the vast majority of its US operations have been mostly shut down, and instead the Chinese parent company does most of its business in China. The last I’d heard is the remnants of Zapworld US were to buy back the remaining Xebra’s. There’s more than a little controversy surrounding Zap, including a lengthy expose article in Wired Magazine a few years ago. 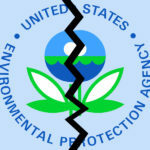 The company engaged in some practices around its stock which skirted the edge of illegal stock manipulation, for example. 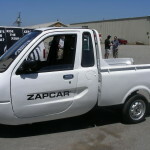 Zap had been run by Gary Starr, a long-time electric vehicle entrepreneur going back to the 1980’s. 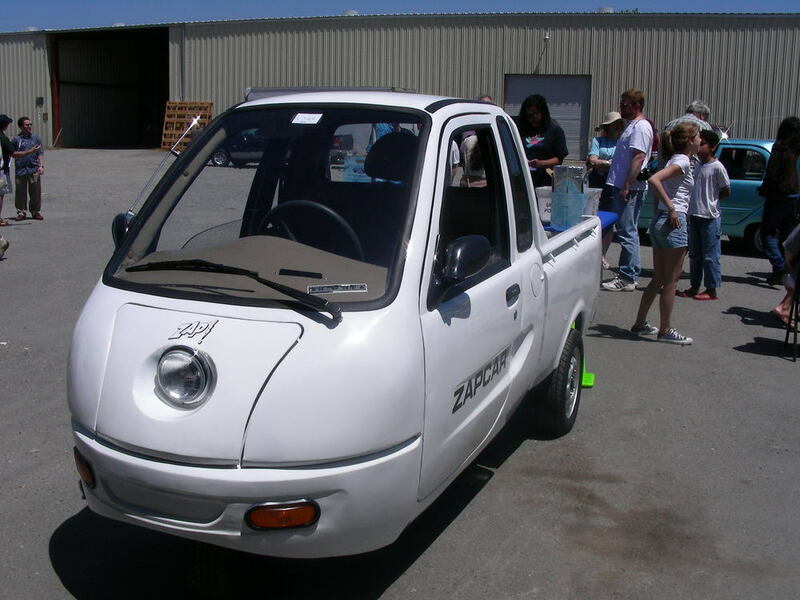 The Xebra is an example of the unfortunate side of three wheeled car-like vehicles. While the Xebra owners generally liked these cars, it’s undeniable there were legitimate safety concerns. It’s also representative of what could occur. 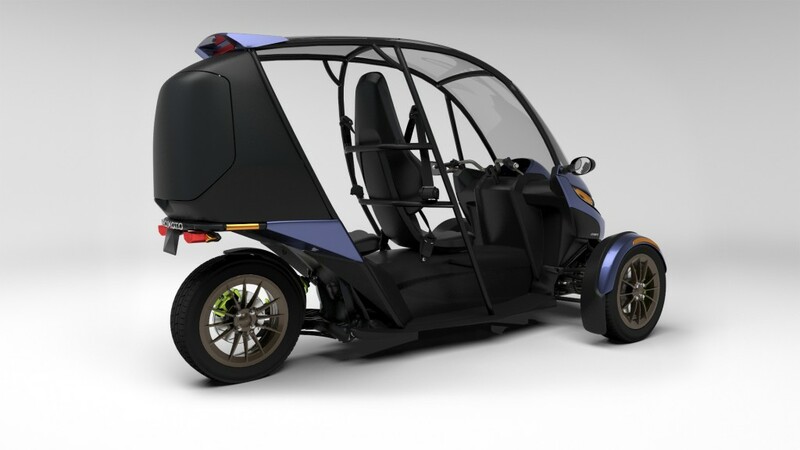 There are dozens of companies in China, India and elsewhere, building three wheelers. 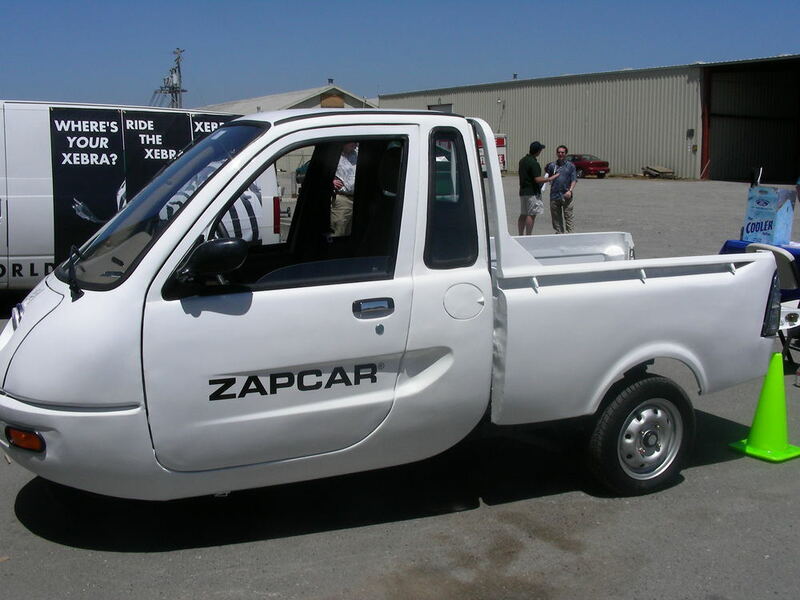 It’s therefore possible to do as Zap did, import one of those vehicles and remanufacture it as an electric vehicle. 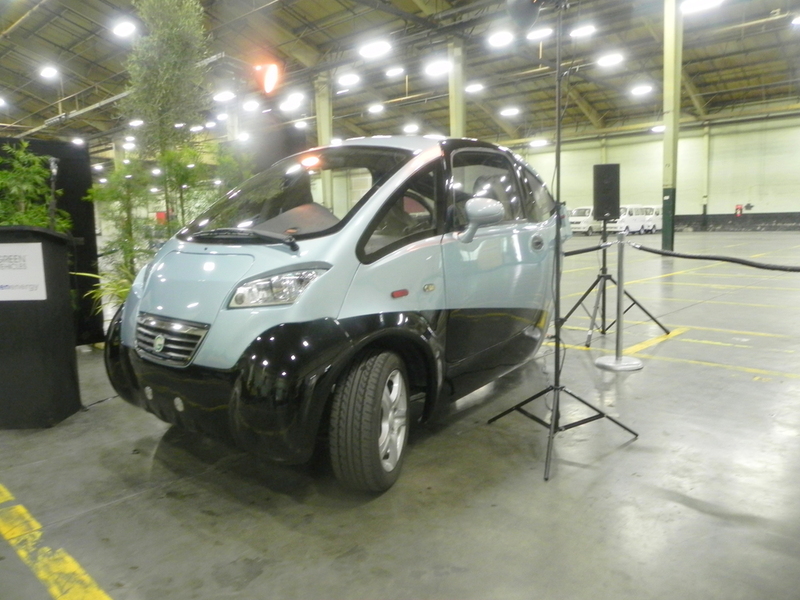 This is another example of a manufacturer who’d imported a chassis from China, and converted it to electric drive. The company, Green Vehicles, was in operation until some time in 2011. These pictures were taken in November 2010 when they held an unveiling of what was to be a production facility in Salinas CA. Before 2012, however, Green Vehicles had gone out of business. It’s possible that a couple of these (brand name: Triac) were sold. I got to ride in one, but not drive it. It seemed okay, but there wasn’t enough experience with them in the public to know whether there were any safety concerns. It sat two people side by side, had regular doors, a steering wheel, and other car-like features. 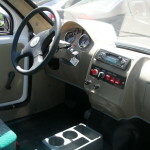 Legally the difference between a 3 wheeler car-like vehicle, and a four wheeled car, is enormous. The three wheeler is classified as a motorcycle, and therefore has almost no safety regulations to meet. Four wheeled vehicles (cars) with speeds above the Low Speed Vehicle classification (hence, more than 25 miles/hr) have a long list of safety requirements to meet. While some companies used this loophole to skimp on safety testing, others did not. For any of these companies named here, satisfying the kind of regulations four-wheel-car manufacturers face would have raised their cost to levels that could not be funded. How many billions of dollars has it taken to get Tesla Motors to where it is today? 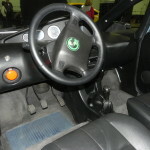 Going by the Wikipedia page for Elio Motors , a startup that’s designed a gasoline powered three wheeler, that company has had immense difficulty raising the funds necessary to finish R&D and start production. It’ll be up to the Dept of Transportation staffers to decide what to do here. 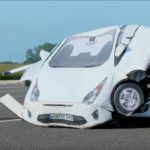 There are plenty of reasons to think three wheeled car-like vehicles should face tighter safety regulations, perhaps as much as four-wheeled cars. 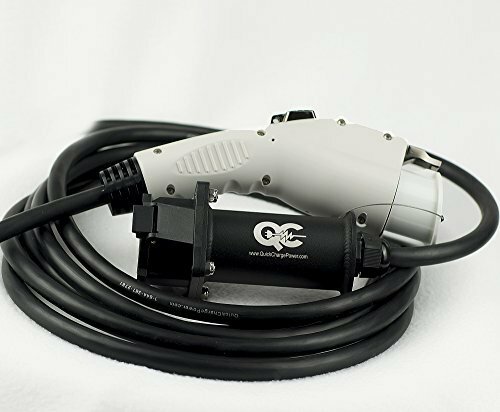 As the NHTSA points out, a consumer looking at one of these would think “car” and that therefore the company did all the testing required for automobiles. But that won’t be the case …. and would there be a tragic catastrophe to result because the car-like vehicle was no safer than any other motorcycle? 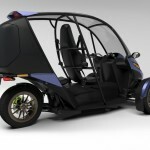 Electric Motorcycles, Three Wheeled Vehicles. Bookmark. Thanks for the long history, but to get to the heart of it, I expect that if 3-wheel vehicles have to meet the same safety standards as 4-wheel vehicles, they will entirely disappear (except for perhaps the Can-Am Spyder or those similar vehicles that exist for performance). When I heard about this, the first thing I thought was, “I wonder what Michigan lawmakers are taking Big Auto money to pressure the NTHSA into this?” Call me paranoid (and I am), call me anti-establishment (and I am), call me absolutely and totally against Citizens United v FEC (and I definitely am), but really- why else would the NTHSA feel the need to change classifications because some people are too naive and/or lazy to do their homework when looking for a new vehicle? I wouldn’t be surprised if Big Oil were in it too- oil is dirt cheap as it is, all Exxon-Mobil and Shell need is 84 mpg vehicles! 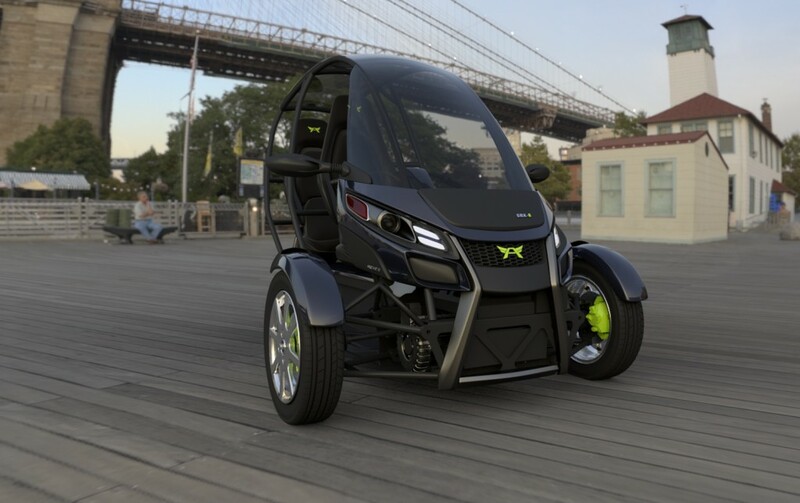 Seems to me that traditional auto manufacturers are getting nervous about what these three-wheel motorcyles-but-not-really mean to them: competition that offers low-priced, economical transportation. 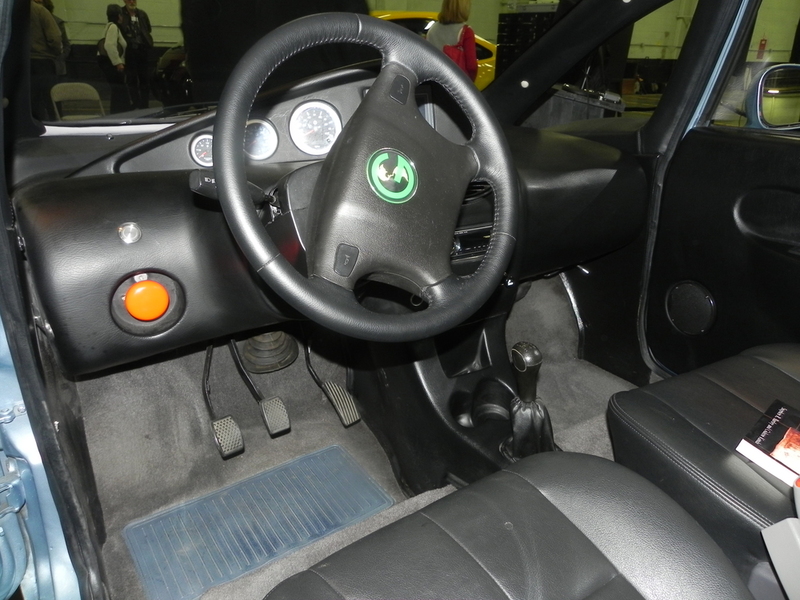 The Elio is supposed to MSRP at $6,800 (assuming it actually goes into production, of course). 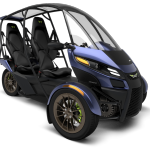 The Arcimoto is more like $11,000- but even then it’s pretty difficult to find anything offered by any large automakers that approaches that price point. But what if these vehicles had to meet more stringent safety requirements? All of a sudden the price point is going to skyrocket and that competition isn’t anymore. This is not so much legitimate safety concerns by the government as it is private sector pressuring the government to protect their economic turf. Use politics to stifle innovation, instead of getting with the program and doing things differently…and it’s just another reason that I’ll put $10,000 into restoring my old ’65 J300 pickup than give any automaker another penny of my money. Hence, NCAP is initiating a new NCAP program in which (I quote) “new tests to assess how well vehicles protect pedestrians from head, leg and pelvic injuries that occur when a pedestrian is struck by a vehicle”. 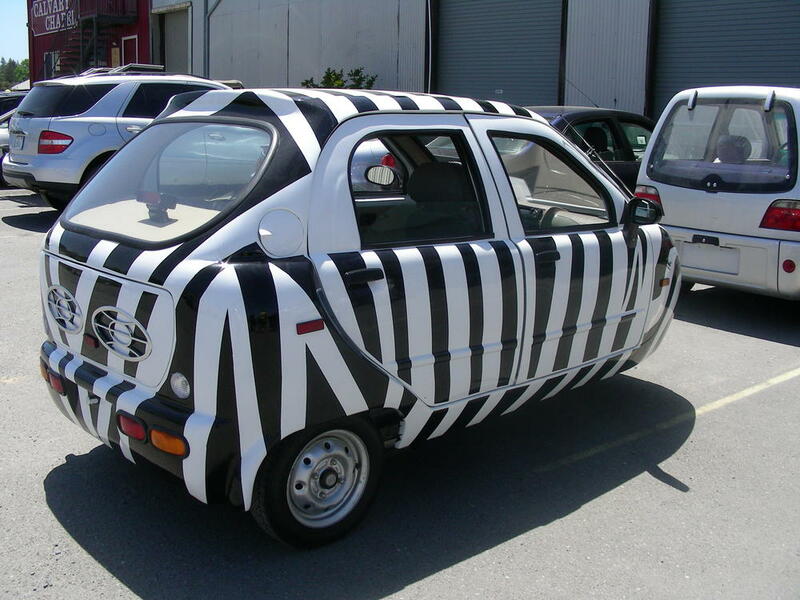 Doesn’t sit well with the exposed front wheels and fenders… at least regarding the legs.